Saves time and effort, but at a higher price. 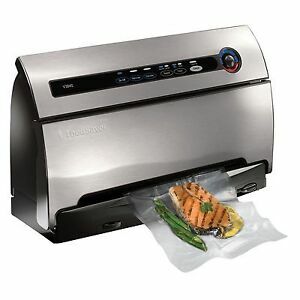 I have been a fan of food savers since they began and i picked this up here on eBay for a good price. There are a lot of bells and whistles so i can't comment as yet on the durability .. it does the job well PROS - You can store a roll in the unit giving you quick access to it when you need it. - Easy to cut the bag to your required size and seal it, by just pressing a button and sliding the bag into a slot - Lots of options, such as for foods which are dry or moist. - accessory option stores inside the unit and can be extracted for quick utilization. CONS - Its a lot higher than the other saran-wrap box shape, so you may find it difficult to find a place to store, unless it stays on your counter. - If you do store it in a high cupboard area, its a little tough to grab onto, or place back into the cupboard. - Its quite heavy, so it may be an issue for small people to reach up and grab it from a shelf. - if the bag end is not flat or straight, the machine may have a problem to grab it in for the vacuum. not an issue with the smaller units. I love this machine. It allows a great option for left overs instead of throwing them out or eating turkey for the next week. Love the marinade option as well. It is however quite noisy when it runs. ...I just placed it on sum thin to absorb the clatter. Love that there is a spot on the bags to date and note as well !